The first test we recommend is to see how heavy the touch is. A simple way of doing this is by using coins. A new £1 is 8.75 grammes; five £1 and a 20p is 48.75 grammes. This is an average weight. If you are an occasional player then you may prefer a lighter weight. If you are practicing for performance then up to 55 grammes may be preferable. 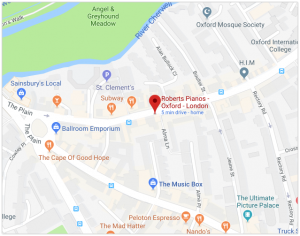 A concert pianist we serve has a light touch piano in his home in the USA and comes to Oxford every summer to give concerts, requesting a heavy touch piano for him to build up finger strength. Take off coins until the key starts to rise. A low up-weight, around 30 grammes, is generally preferable. Upweight is usually difficult to alter without doing major work. Digital pianos normally don’t have a low up-weight. Test the key dip: This is usually between 10.5 and 11.5mm. Any shallower and the hammer probably won’t reach the string when you press the key down slowly without the note sounding. This will make sensitive playing impossible. Too deep key dip also makes it hard to control the playing. Lost motion: This test can be done without removing the front panel but if possible, remove it. Press a key down very slowly without the note sounding. Do you feel any slack before the top part of the action moves? If you have the panel off then it should be visible. This is called lost motion and greatly impedes sensitive playing. Set-off or Let-off: Next look to see how close the hammer gets to the string before it comes back (sets off). Again, press the key down very slowly. The hammer should get to within at least 4mm before coming back. The closer it gets, the better is the control for soft playing. The minimum closeness is usually about 2mm. Pianos fitted with a silent system generally can’t achieve closer than 4mm so are less sensitive. Dampers to sustain pedal: These shut off the sound after the note is played. If you lift press the right hand pedal then they all come off together. look inside the top of the piano. The dampers should all lift off at roughly the same time and lift off so that all the strings sound. Please see the video for a demonstration. Dampers to key: Depress a key slowly without the note sounding. The dampers should lift off when the hammer reaches between 1/3 and 2/3 of the way to the string. If they are too early then they may not work at all or the touch may feel heavy. If they are too late then they may not lift off sufficiently, especially when playing staccato. – There are several other items of regulation that affect the touch but these are some of the easier ones to identify. Key dip. This is the same as for upright pianos. Set-off: Press a key down very slowly without the note sounding. Look at the hammer rising. You may need to take off the music desk to do that. As with uprights, the hammer should nearly reach the string before setting off. If it doesn’t then either the hammer height is too low or the set-off is too early, or perhaps both. This greatly impedes soft playing. If a grand piano needs regulating then this is best left to a technician. All modern pianos tend to have a touch between 49 and 52 grammes (some new ones are a little heavier). If you want a lighter touch then it is probably best to buy a used piano. However, on quality new pianos is usually possible to reduce the touch weight too. Look at the hammers. Are they very indented? If so, then they may sound soft or not bring out the upper partials (harmonics) and so the tone can be dull or unintersting. This can often be cured by refacing, which needs to be done very carefully and the hammers will need fine voicing afterwards. Bear in mind that if a lot of felt is taken off then the touch will also become lighter and the hammer may also not perform correctly. Play every note from bottom to top. Do some notes sound much more out of tune than others? That may mean that the tuning pins are loose; this might be cured by replacing them with larger pins, but in many cases, the wrest plank will also need replacing. Check the pitch of the piano by downloading a tuning app. Test A4 (note 40). This should read between 440 and 443. If it is very flat then the piano can usually be pitch raised. Do the bass strings sound very dull? This can sometimes be improved by turning them in the direction of the winding. We have often found that those listening to our videos or reading information try to regulate or do other work themselves, but we don’t recommend that. If you have no piano technician near you, then you may not have any option, but please proceed very cautiously indeed. We hope this page has been of some help. Please feel free to write to us if you have any questions.